Factory Farm Investigations Mapped is a catalog of many of the undercover factory farm investigations conducted to date. You can watch a video created from each of the 76 investigations conducted by 5 different organizations throughout the United States since 1998. The investigations are also categorized by animal - Layer Hens, Broiler Chickens, Pigs, Dairy Cows, Beef Cows, Fish, Turkeys, Ducks, or Deer. It is updated regularly. The latest undercover investigation was added in February 2012. Its a great resource. Click here to check it out. No gore in this video, but its powerful nonetheless. Please watch. Standard industry practice in pig farming involves the use of gestation crates, which are so small the pigs can't turn around. Newborn piglets have their tails docked and their testicles cut out without any painkillers. Sick piglets are left to suffer to death, receiving no veterinary care. Turkeys have been bred to have such large breasts that they cannot mate naturally. Turkey farmers must "milk" the male turkeys and inseminate the females. Watch how this is done here. Like human women, cows must give birth to produce milk. The are raped and impregnated, and after they give birth their babies are stolen so that every drop of milk can be collected and sold to humans. They are promptly raped and impregnated again to maintain maximum milk production. 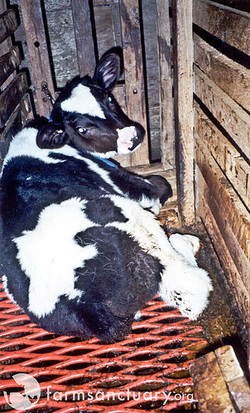 Although they can live up to 25 years, dairy cows' bodies are pushed so hard by the repeated pregnancies and intense milk production, they are considered spent and sent to slaughter at 4-5 years old. Having been treated like milk-producing machines, many of these worn out mothers bodies have been so depleted that they can't even walk to slaughter. Milk comes from a grieving mother. Mother cows love their babies as much as human parents do. They want to nurture and protect their young, and grieve intensely when their newborns are taken away shortly after birth. Layer hens endure some of the worst cruelty of all animals. They are confined in cages so small they can't spread their wings, and they often share their cages with rotting corpses because they die too frequently for workers to keep up with removing the bodies. Even if you buy cage-free eggs, you're still supporting cruelty. All layer hens come from hatcheries like this one, where the male chicks are killed soon after hatching by being thrown into a meat grinder alive, or dumped into a trash can to suffocate to death, because they are useless to the industry. The female layer hens have their beaks sliced off with a hot blade, which causes both acute and chronic pain. Did you know my mother? I'm told her name was Belle. I don't know what she looked like, but have memories of her smell. Did you ever hear my mother?...Did her cries pull at your heart? I remember them quite clearly, when the men pulled us apart. Did you drink from my mother? Did you ever taste her milk? Did you feel her face against yours? Was her skin as soft as silk? Then my mother went to slaughter, of no value anymore. Were you there with my mother? Did you look into her eyes? Did you see the fear within them? Did you listen to her cries? We are huddled close together, In this place where all life ends. Will you be there at our slaughter? For the flesh you want to eat. Will you ever think about us? When you buy that piece of meat. It's my turn now, I'm moving. I am going to my end. I am urged with shouts and kicking, and with sticks that never bend. I am thinking of my mother, and remembering her smell. And I know we'll meet in heaven, and forget this life called Hell.